Happy National Ice Cream Sandwich Day! Who else is glad the ice cream holidays continue outside of National Ice Cream Month? If you're not raising your hand, you're lying! As I often do, I'll thank Martha for the initial inspiration behind these sandwiches. There was an article in one of the Summer issues that suggested doctoring up store bought ice cream and well, it seemed like a fun idea. I had bought this ice cream initially because it was on sale and I'm always game to try a new-to-me brand of dairy-free ice cream. After serving it to guests topped with homemade plum compote, I was sold and promptly went back and bought like three more pints. Make these before your next dinner party or barbeque for a fun twist on the perfect seasonal dessert! Let the ice cream warm up a little and empty both pints into a big mixing bowl. Add the diced dried pineapple and mix in to the ice cream. You could do this in a mixer, but I used it as an arm workout and mixed everything with a wooden spoon. Transfer the ice cream to a loaf pan or casserole dish, cover with saran and place back in the freezer for up to two weeks. 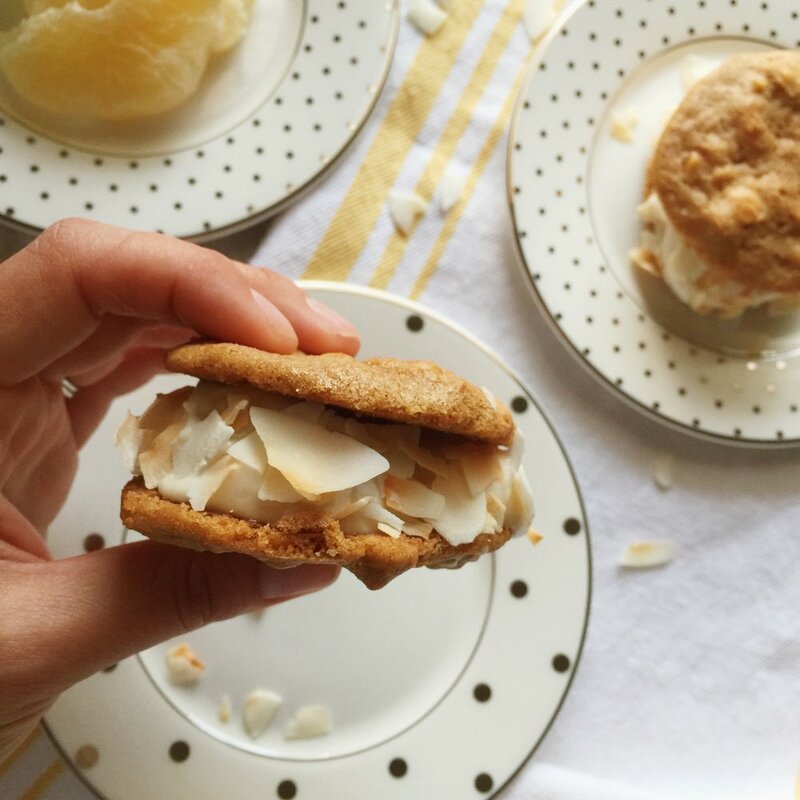 When you're ready to make ice cream sandwiches, let the ice cream soften up a little and place a scoop or two between two cookies and press some toasted coconut around the outside of the ice cream. You can serve them right away if you don't mind a mess, but if you prep these ahead of time you can put the sammies back in the freezer to set again before serving.